Grammy Nominations: Four. Including best rock song with his band Foo Fighters. Photographed with: His mother. Virginia Grohl, at his Encino, California, home on January 4th. 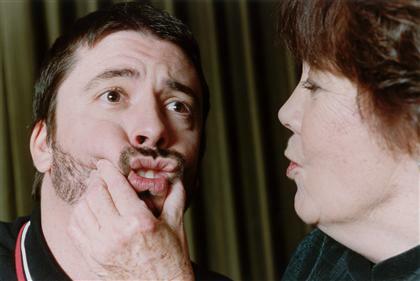 Dave Grohl: "When I'm with my mother, there are times I realize that I've become a man, but I'll always be her child. When my sister and I were growing up in Virginia, we were a close family. We lived in a small town outside of Washington DC. My mother was a high school English teacher for 35 years so we all drove to school together in her Ford Fiesta." Virginia Grohl: "We all fought for time in the really small bathroom." Dave: "It was like an airplane bathroom, with three people fighting for the shower, and Mom making cinnamon toast and sticking shirts in the dryer to warm them up because it was cold outside." Virginia: "Living in a little box affects the way you live. You either get along or you go your seperate ways early on. We were okay with it." Dave: "My mother and I were friends. [By the time I was a teenager] we'd go to jazz clubs or she would come see my bands." Virginia: "It's very exciting to see the buildup when his band plays, to hear the roar of the crowd. When I was teaching, I had a senior class and had just come back from time on the road with Nirvana. I said to the class 'I've been teaching for 30 years and had all kinds of successes, but I've never had a roar.' Then one day I was called out of the room. When I came back, the class gave me a roar." Dave: "Our relationship is constantly evolving. My wife and I are going to become parents in a few months, and imagining my mother as a grandmother makes me glow. The connection my mother and I have is the ultimate parent-child relationship. She allowed me so much freedom growing up that when I said I wanted to drop out of high school and join a band, she gave me permission to do it. She had faith in me. She's always said, 'It's nice when things are nice.' That's become a mantra of my own." Virginia: "It's a stupid saying ...."
Dave: "But it's true! I was going to tattoo it on my back!"